This year’s Philippine Independence Day celebration on June 12 will restore the pomp and significance of the civic-military parade at Rizal Park Grandstand (Luneta) in Manila. “For the last two years, we have been focusing on major programs and projects of the government and did away with the usual civic-military parade. This time, we are returning the parade to showcase the achievements of the country,” said Ludovico Badoy, executive director of the National Historical Institute (NHI), which was designated the lead agency for this year’s Independence Day celebration. This year’s Philippine Independence Day parade will feature 10 floats highlighting the 10-point agenda. An 11th float will honor the country’s modern-day heroes, particularly those who have made names for themselves here and abroad in their respective fields of endeavor. Badoy will flesh out the details for the Independence Day celebration and the coming Flag Awareness Day during Wednesday afternoon’s meeting of the Technical Working Group, which he chairs. The Independence Day festivities will be launched with Education Secretary Mona Valisno as the guest of honor and speaker in an event in Cavite City to commemorate the Battle of Alapan where the Philippine flag was first hoisted at Teatro Caviteno by Gen. Emilio Aguinaldo in 1898. The Philippine Flag will be simultaneous raised nationwide at 8 a.m. To give homage to the flag, NHI will ensure that Philippine flags are prominently placed in all major thoroughfares. 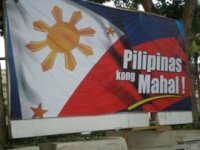 Badoy also urged both the public and the private sectors to proudly display the flag not just outside their offices but also outside their homes. On Independence Day, “we expect the President to be there at 6:45 a.m. and lead the flag raising simultaneously with other local government officials all over the country,” Badoy added. There will be the usual simultaneous flag-raising and wreath-laying ceremonies at 7 a.m. at the Rizal monument. The parade will take place in the afternoon. There will be a fireworks display immediately after the parade.